Every year as the Fall season begins to decorate New England with golden yellow and red leaves, everyone craves warm apple pie and pumpkin-spiced everything. I, on the other hand, can only think of soft, chewy pretzels dipped in warm, cheesy goodness to go along with my favorite Oktoberfest beers. 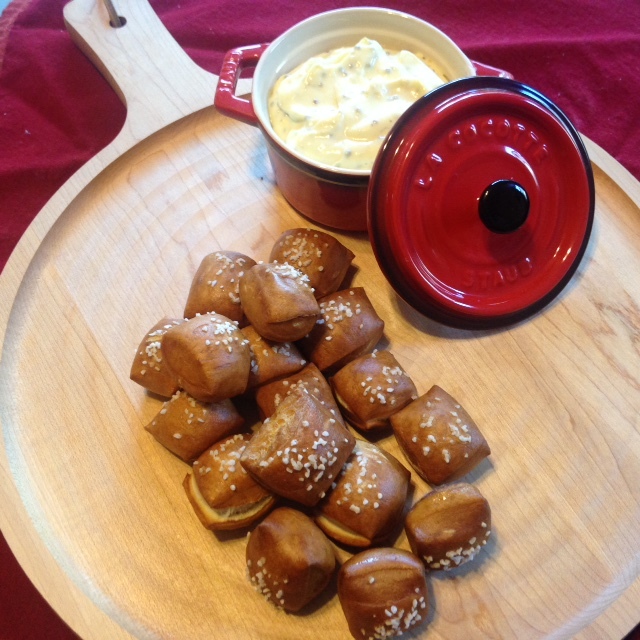 Whether it’s game day, or the last of the season cookout, these pretzels with a mustard cheese dip are sure to be a favorite. What makes pretzels so delectable is a little food chemistry in every bite. That shiny, brown crust is not a product of baking, but of its pre-baking soak. That unique sheen and alkali flavor traditionally come from lye – sodium hydroxide. Lye is a caustic liquid, also used in curing olives, making certain Asian noodles, and soap making. Being corrosive, it is difficult to store and dangerous to handle. A baking soda boil will work to mimic that distinctive taste and crust. This recipe goes really quickly in a stand mixer, such as a Kitchenaid. However, if you don’t have a stand mixer, fear not – pretzels can also be made the good old-fashioned way! Kneading the dough by hand yields delicious pretzels and lets you work out a little stress. Stir yeast into slightly warm water (think body temperature) in a mixing bowl. Add flour, butter, and salt. Mix with wooden spoon or mixer fitted with a dough hook until dough comes together. At this point knead the dough for 8-10 minutes on low speed on a mixer, or on a generously floured surface with floured hands. If kneading by hand, try to layer the dough. Pat it down flat; fold in the sides and top; and then with the palm of your hand, push the center of the dough forward to seal in the edges. Rotate 90 degrees and repeat. Continue for 8-10 minutes, keeping surface and hands well floured, until dough is smooth and soft. Place dough in a bowl sprayed with cooking spray. Spray the surface of the dough and cover bowl in plastic wrap. Let rise in a warm place for 45-60 minutes, until dough doubles in size. After dough has doubled in size, flip out of bowl onto a floured surface. Pat flat and gently pull corners to roughly square shape. Using a knife or pizza cutter, cut into 1” by 2” squares for pretzel bites. If you want to go with the traditional Bavarian shape, divide dough into 8 equal pieces and check out this slideshow from Food & Wine. After cutting or shaping pretzels, place on a floured cookie sheet and chill for 2 hours. In a large pot, bring water and baking soda to a boil. Boil pretzel bites, a few at a time, for 20 seconds, and remove with a slotted spoon or spatula. Arrange on cookie sheet lined with parchment paper or well sprayed. Lightly salt pretzels while still damp with kosher salt or large flake fleur de sel. Bake at 350 degrees for 8-10 minutes for bites, or 18-20 minutes for Bavarian shaped pretzels. In a medium-sized saucepan, melt butter over low heat. Add flour, whisking constantly. Cook for 2 minutes, until lightly tanned. This is called a roux, and cooking the flour will remove the grainy mouth feel. Slowly whisk in milk, being careful to stir out any lumps, and continue to stir constantly. The sauce should slowly thicken as the milk heats up. Add the cheese and mix until melted. Remove from heat. Stir in the whole grain mustard. For an extra kick, add a few drops of your favorite hot sauce. Serve warm. Brittany Hagan is a second-year BMN student who left her career as a chef to pursue a future in nutrition science. When she’s not cooking or studying, She can be found roaming the streets of Somerville with her puppy, Millie.